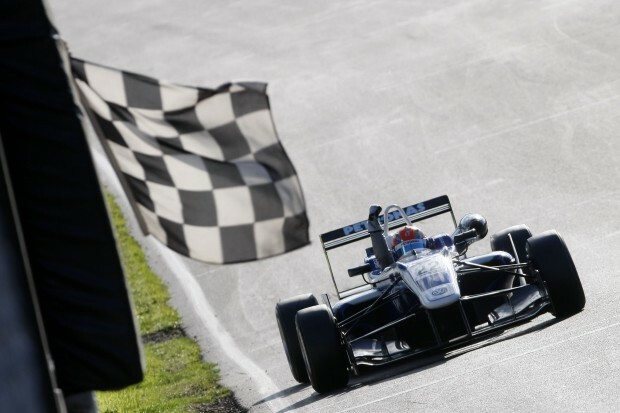 Jazeman Jaafar returned to familiar territory this weekend, competing in the Brands Hatch round of the Cooper Tires British F3 International Series, taking two wins and three podiums in the three races at the UK circuit. The 20-year-old Malaysian’s participation to ensure he is eligible to race at this year’s Macau Grand Prix reaped dividends with a dominant performance from the Carlin driver and impressive drives in all three races. Jazeman led the way in the first practice session, blasting into the lead after only a few laps and putting himself over four-tenths of a second ahead of his nearest rival. Despite his superiority, Jazeman worked with his Carlin engineer to explore different set up options in the afternoon session rather than going for outright speed, but was still second quickest. Qualifying was an opportunity for Jazeman to put his experience to good use. Changes in set up from the afternoon practice session proved positive and the PETRONAS Talent Programme driver was quickly on the pace with his first set of tyres, vying with Jordan King for the top spot on the leader board. Never showing any signs of pressure he kept the best until last, putting on his second set of tyres and with just a few minutes of the session remaining, drove two superb laps to record the quickest two laps and secure pole position for the first and third races of the weekend. It was a lights to flag victory for Jazeman in the first of the three races held yesterday afternoon, with the young Malaysian controlling from the front and never looking in doubt for the win. The top eight reverse grid second race was more of a challenge, with an eighth place grid slot for Jazeman this morning. As the red lights went out for the start of the race Jazeman was quick off the line and burst through to fifth place to lie in this position for the first few laps. He then moved up to fourth position and then into third by the midway point. He held off challenges from behind to take the final podium spot. The final race of the weekend saw another dominant performance with the Formula Renault 3.5 Series regular taking a commanding lead from pole position and building a seemingly unassailable gap of nearly 3 seconds before back markers held up the young Malaysian, with the chasing pack closing in as the laps counted down to the chequered flag. Jazeman showed his prowess in the F3 category holding off his attackers to take a second win and his third podium of the weekend. Jazeman returns to his regular championship, the Formula Renault 3.5 Series, next month.